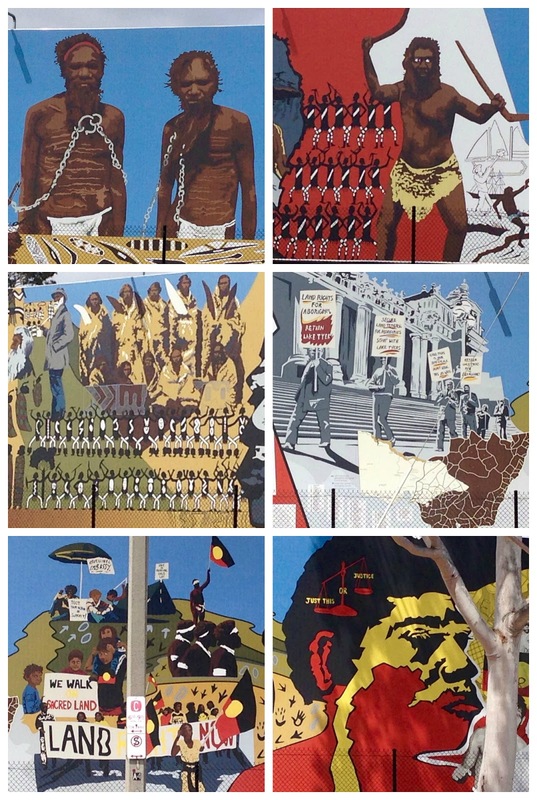 If you go on the NAIDOC March today you will probably at some stage hear someone chant, "always was, always will be Aboriginal land". A lot of the time, there are so few reminders that we are on Aboriginal land that it saddens me. 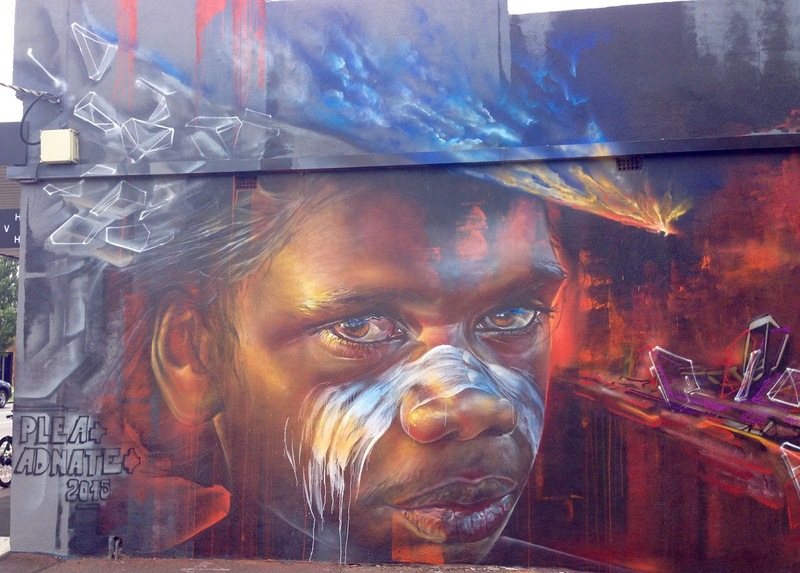 Occasionally I am gladdened by the sight of Aboriginal inspired street art. 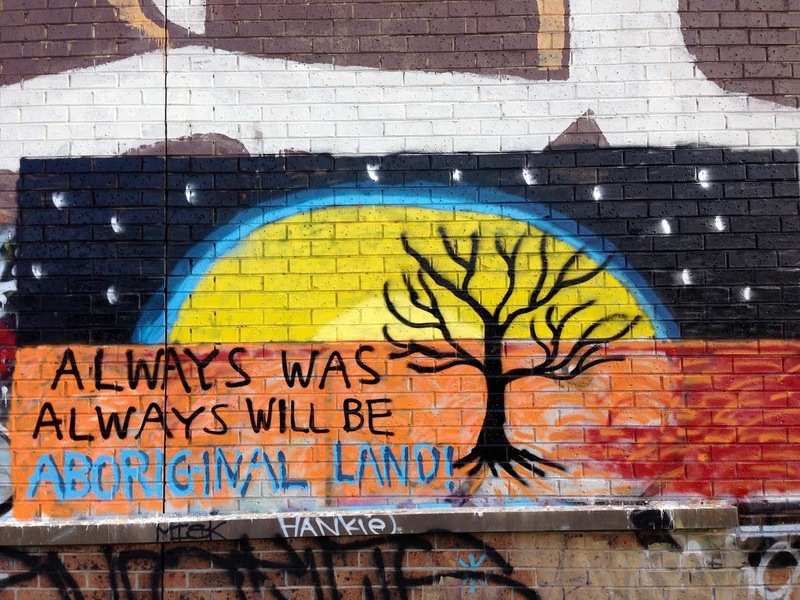 Today to celebrate NAIDOC week I am sharing some photos of Aboriginal street art around the inner north of Melbourne. The above photo is from the Upfield train line near Bakers Road. 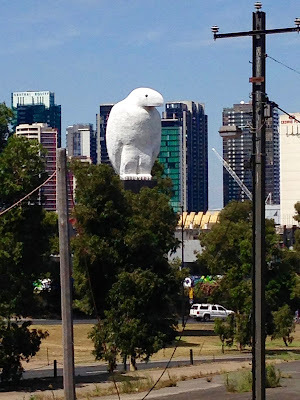 I am not sure if this giant statue of Bunjil the Eagle that watches over Wurundjeri Way is street art but it is public art. And it is important art in the centre of Melbourne, reminding us that we are on the land of the Wurundjeri people. A signal box in Thornbury. An impressive mural on St George's Road, Thornbury. 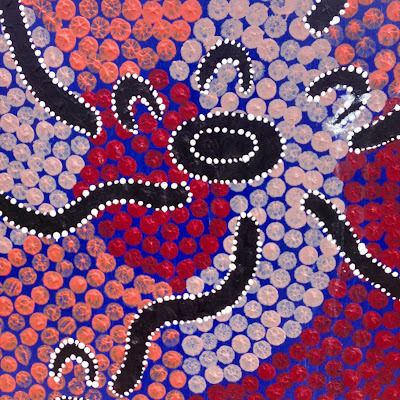 Unfortunately it is such a busy road that it is hard to take in all the details which tell of the history of Aboriginal people. Here are some close ups of the mural. 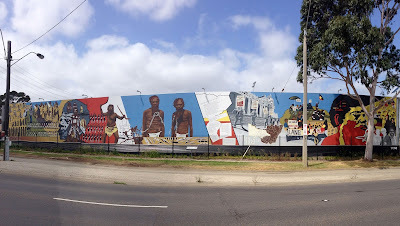 You can read more about the mural which is owned by the Aboriginal Advancement League on the Northcote Koori Mural Wikipedia page. 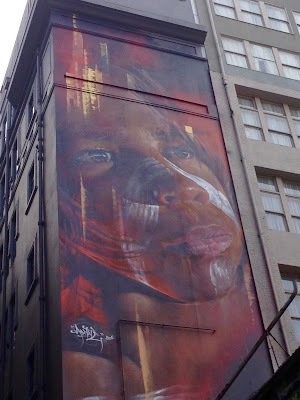 You can see more Aboriginal street art photos and also see my Aboriginal flag cake that I made this week. 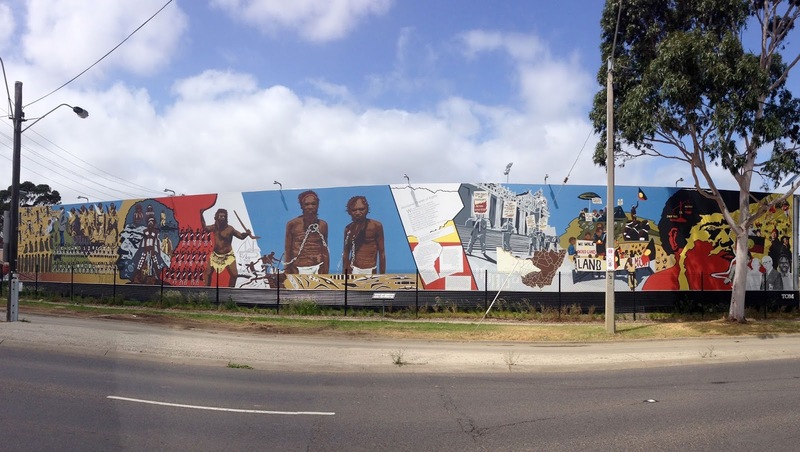 The Aboriginal Advancement League Mural is really powerful. Thanks for the link, I will certainly check it out. The graffiti artistry is poignant and solemn in some places, it does take my breath away and reminds me of past histories. Thank you so much for sharing Johanna. Thanks Shaheen - street art is very powerful when it makes us stop and think and stirs emotions! A beautiful way to remind us every day of Australian history! 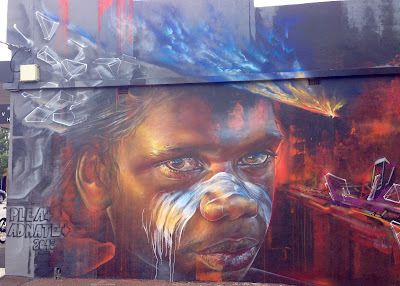 What a great collection of art pieces - Melbourne does street art so well and this themed set is impressive (and of course so appropriate this week). I didn't know the significance the eagle before. Great photos. There is a gorgeous mural of an aboriginal child that you can see along the train line near Dimmeys in Richmond. 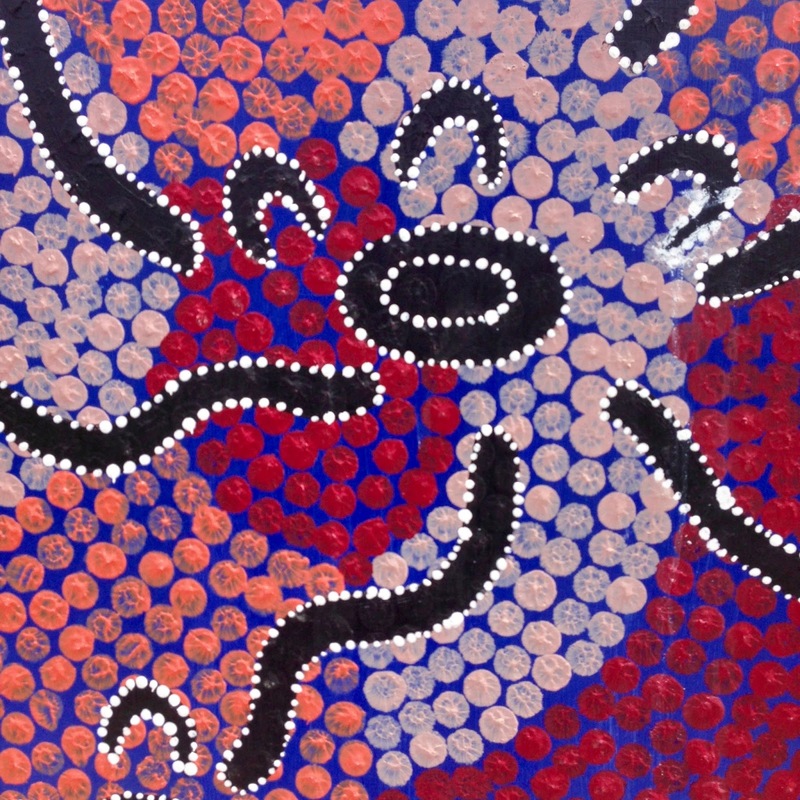 "A lot of the time, there are so few reminders that we are on Aboriginal land that it saddens me." I like that you guys celebrate. Thanks Kimmy - that sounds sad to hear about your town - are there many reminders of its Indian past?